The Autumn issue is out at Easter and in keeping with our theme of 'new beginnings' we've had a bit of a design refresh with a new textured cover stock to boot. Angela Keoghan created the beautiful cover illustration and number 11 is bursting at the seams with great content from the likes of Olivia Coote (who put together a sweet housewarming gift tutorial), Martha Goes Green (with recipes for a baby shower), and Sonya Nagels (who photographed and interviewed recent returnees and an amazing converted hotel in Raglan). Pia Jane Bijkerk talks about her new book project and Julia Atkinson of Studio Home chats about her relocation to Auckland. We've also got the first installment of our new series of cheat-sheets (this one's on promotion and marketing) and of course there's more inside! 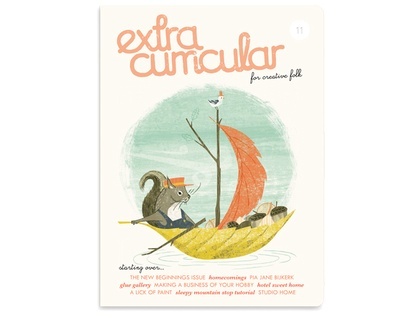 Extra Curricular is printed in full colour with vegetable based inks on 100% FSC Certified stock (inner pages 100% recycled). * Orders are sent from Auckland, New Zealand and packaged in a cellophane bag to avoid water damage from leaky mailboxes!